Daryl Powell admitted his team had some big lessons to learn after their drubbing by St Helens. 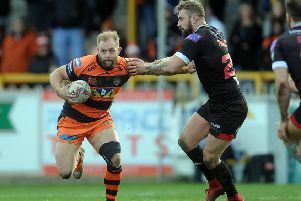 The Castleford Tigers head coach was angered by aspects of his players’ performance as they were way off against an admittedly impressive Saints side. Powell said: ‘There were two teams playing at different levels. They were outstanding and we were poor. “It was a disappointing night and we’ve got some searching to do as we move through this next week. “We got rattled by the game. They started really well, but at 12-0 I thought we’re hanging on and were starting to speed the game up ourselves. Then there was a poor decision when we got a repeat set and he did us for a push – I’m not sure about that. “They come up then Greg Eden makes an error, they score and it’s 18-0. “The second half we were terrible, we just didn’t get a grip of the game at all. There are no excuses, we just got completely outplayed. “They are an outstanding side at the moment with no injuries. There are some reasons for where we’re at, but they are not excuses. “We’re trying to find a groove for ourselves and we never got in the game. “We got rattled by the speed of the game. We’ve got to handle the speed better. We’ve got a lot of work to do. On substituting Greg Eden early in the second half after the top scoring winger had a real off night, Powell added: “Greg does things at 100 miles an hour and sometimes that doesn’t give you time to think. “Some of his decision making didn’t have a lot of thought about them. It was a tough one for him. Every player has them and he’s got to come back from it. “We know there’s an outstanding player there. He’s shown that time after time.